Do you find yourself reaching for teacups that "match" the season? I do, and I've been so smitten with the glories of spring lately, I couldn't help looking into my tea cabinet for something in pastel florals. What I found was a teacup I'd forgotten about for a while, this green chintz one. 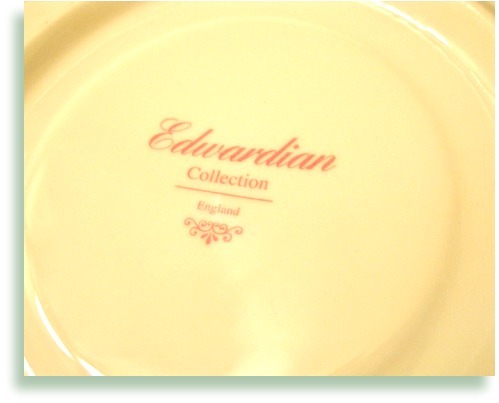 This backstamp indicates this teacup was made in England! I was quite surprised, because I'm fairly certain I paid less than $10 for this at T.J. Maxx or Marshalls a few years ago, and I have long thought it was one of those newer designs from Gracie's. I still know that it's fairly new, I'm just pleasantly surprised to learn it's from England! Recently I was looking up some statistics on world tea production and consumption when I came across this 2015 publication from the Food and Agriculture Organization of the United Nations. If you're a tea geek as well (and hey, I know I'm not the only one here), I think you'll find this most interesting! And on page 8, I was intrigued to learn that while both black tea and green tea production are expected to increase, green tea production is expected to grow at a faster rate. 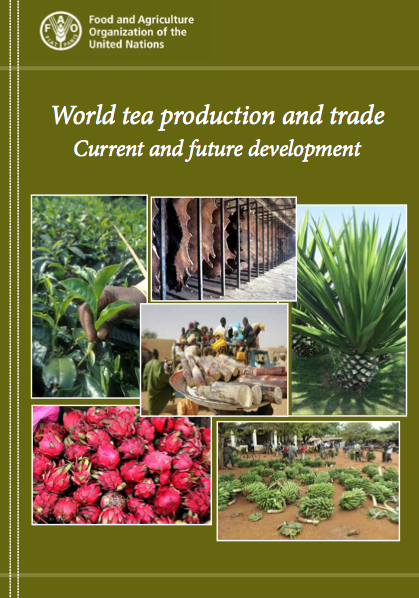 There's lots more to ponder in this intriguing report, and I'm just pleased that tea production is so important that a group within the United Nations deems it worthy of study! Pique Tea Crystals recently sent me some of their new tea to try, and I was intrigued because, one, this is a new type of tea product, and two, the company sources its tea from Tea Master Roy Fong, the noted San Francisco tea purveyor. 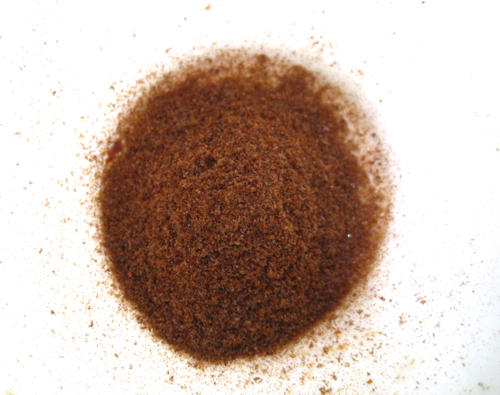 Here is what the English Breakfast Tea looked like when I poured it out of the packet. And here is what the steeped tea looked like. 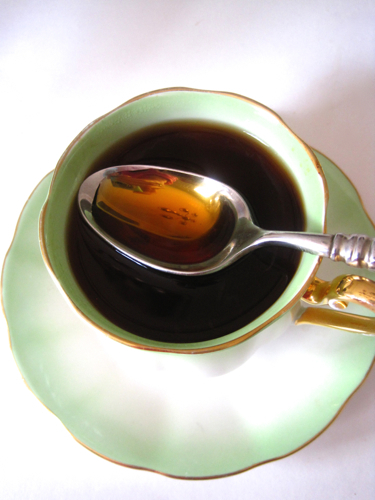 (That reflection in the spoon is from an overhead light fixture, not anything in the tea!) I was impressed that no floating particles appeared as I have seen in other forms of instant tea over the years. Best of all, this tea tastes *exactly* like steeped loose leaf tea. According to founder Simon Cheng, "After scouring the world in search of the best tea farms, tea masters and tea makers, we developed a way to brew loose leaf tea and then crystallize it. We work with our Tea Master, Roy Fong to source the best leaves from trusted farms, brew the leaves at exactly the right temperature and right time (so you don’t have to), then remove the leaves and distill that brew into Tea Crystals. Now all you have to do is add water and voila! You have exceptional tea in an instant." 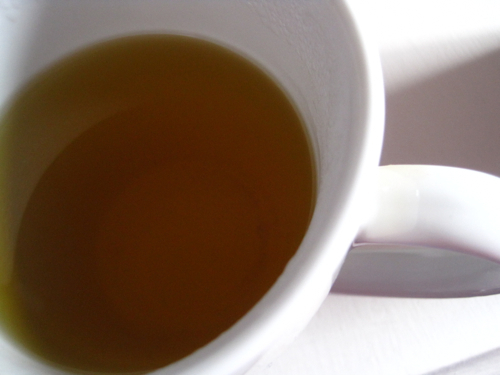 And here's what the steeped sencha looked like, also nice and clean in looks as well as taste. I must say I was impressed that these tea crystals tasted just like loose leaf tea, right down to the nice mouth feel I detected upon finishing my cup of sencha. 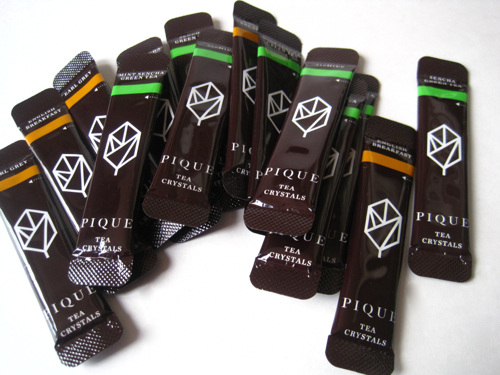 If you'd like to learn more about Pique Tea Crystals, click here. 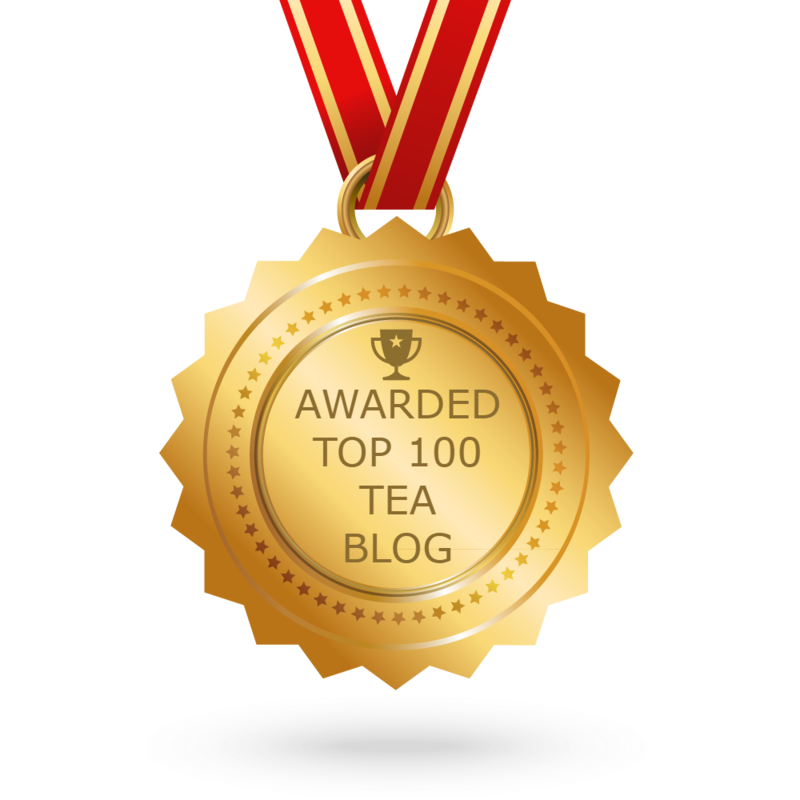 Laura A. Lee, Margie of the Tea in the Valley blog, and Joanie! 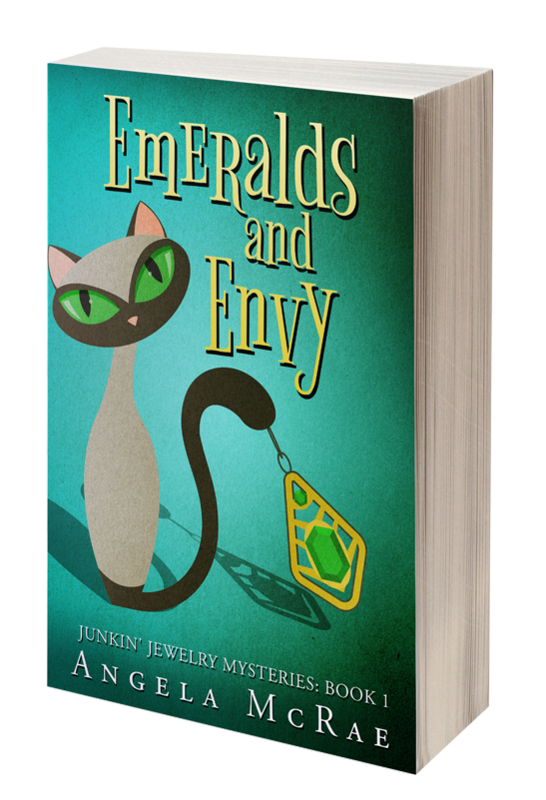 I already have Joanie's address, but if Laura and Margie will send me your snail mail addresses via the email button at right, I'll send your books as soon as the order arrives! And again, for anyone who would like a signed copy, I'm accepting orders through Friday, which you may purchase via the PayPal button at right (or email me for my address if you prefer to send a check by snail mail). I should receive the books within two weeks of that time. Thanks so much for your interest, and I'll no doubt be giving away another copy or two as the year goes on, so stay tuned for other chances to win! They say you can't judge a book by its cover, but of course that's not true, as we all can and do judge books by their covers all the time. I will read just about any book with teacups or teapots on the cover. A few years ago I read this one, I want to read this one soon, and I just finished reading the one above, "The Rejected Writers' Book Club" by Suzanne Kelman. I found this book on NetGalley, a service which allows authors and publishers to share their books with reviewers, bloggers, journalists, librarians, and others who get to read them for free and, hopefully, share reviews of them with others. 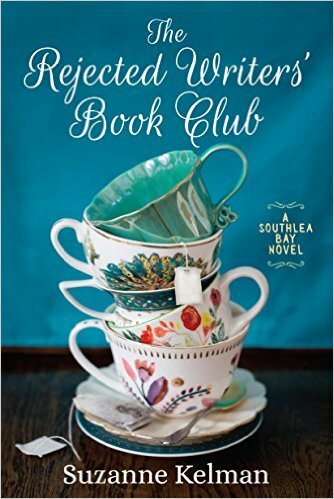 Our narrator is librarian Janet Johnson of Southlea Bay, Washington, a small "village" where some eccentric women writers, the Rejected Writers' Book Club, routinely gather to share tea and cake—and their rejection letters. Rejection has become a way of life for these women, and alas, one of them, Doris, threatens to destroy the harmony of the group when she receives an acceptance letter for her book about Jane Austen, who "was abducted by aliens, time travels, and then goes back to the eighteenth century with a dishwasher." If that sounds farcical, well, it is, but as long as you accept the slapstick nature of the plot, and I did, this is quite an enjoyable romp. Janet has an adult daughter in San Francisco who is having problems with her pregnancy. When word gets out that Janet is headed there to visit her daughter, Doris and some of the other women decide they'll hitch a ride south with her so they can visit the San Francisco publisher who mistakenly, they believe, accepted Doris's book. They're going to barge right in and demand that the manuscript be rejected instead. Along the way, it comes to light that some personal secrets of someone very close to Doris may have inadvertently been revealed in the book, and she feels time is of the essence in getting her manuscript back before it makes its way into print. Although the book is set in Washington, I noticed early on that the author uses some terms such as "village" for "town" and "holiday" for "vacation," so I found myself stopping to see if she was British, and I learned she was born in Scotland and raised in the UK, thus her terminology. Once I got past that slight adjustment, I was able to read the story with ease, and I was quite entertained by the adventures of the laid-back librarian and her oddball friends. Some of the characters they meet on their road trip to San Francisco are simply delightful, and I found myself smiling at more than a few points along the way. I think some of you might enjoy this book as well, and I do hope there will be more tales involving the rejected writers of Southlea Bay. Idaho. Potato country. Is there anything related to tea in Idaho? Why, of course there is! • I have a hobby of researching old department store tearooms, and in the course of my cybersurfing about Idaho this week, I learned about The Mode, a department store of yesteryear once advertised as “Idaho’s Largest Department Store.” An ad in the December 2, 1919 Evening Capital News of Boise notes, “The Tea Room has become the meeting place for the patrons of The Mode and many special luncheons and afternoon tea parties are successfully given in this atmosphere of quiet refinement. A visit to Boise is not complete without a pleasant hour in The Mode’s Tea Room.” I also found a recipe for The Mode’s Cinnamon Rolls passed on by someone whose mother used to work in the tearoom. Fun finds! • You can't mention Idaho without mentioning Idaho potatoes. Why are they so special? The Idaho Potato Commission says, "So why are Idaho potatoes so much better than the rest? Idaho’s growing season of warm days and cool nights, combined with plenty of mountain-fed irrigation and rich volcanic soil, produce the unique texture, taste, and dependable performance that keep customers asking for more." So there you go. 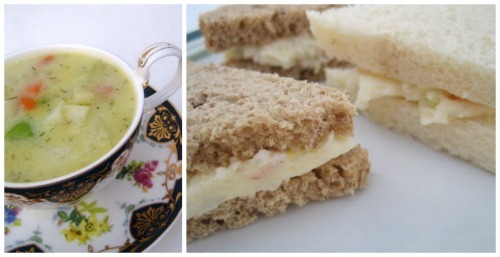 And in looking back through my blog over the years, I see I've included two teatime recipes that include Idaho potatoes, the Old-Fashioned Potato Chowder at left, and the Japanese Potato Salad Sandwiches (yes, with Idaho potatoes!) at right. 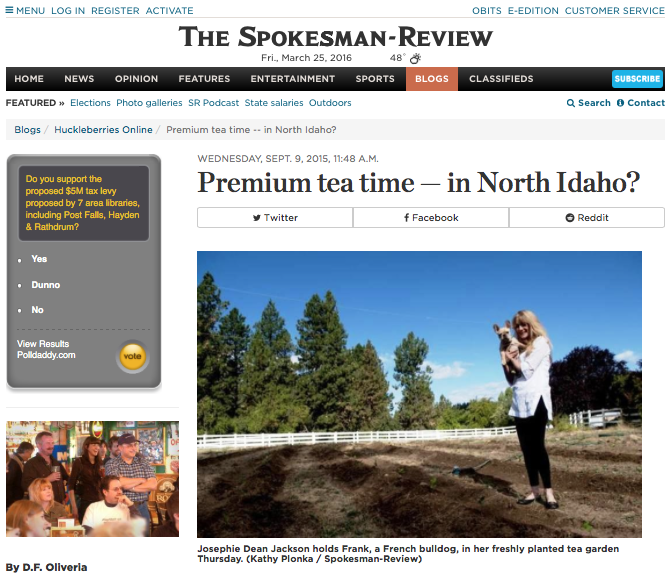 • You know how it's claimed that tea is growing all across the US these days? I found a recent article in the Spokane, Washington Spokesman-Review about a woman from Australia who moved to Texas but is now growing tea in north Idaho. 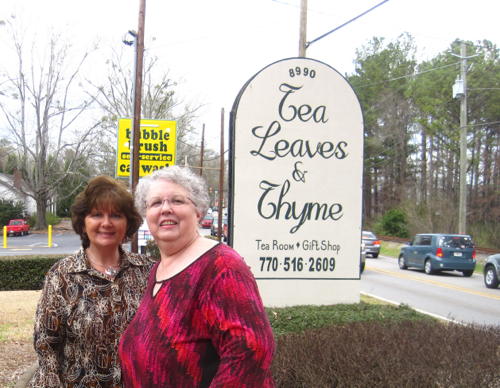 Click here to read about Josephie Dean Jackson's tea-growing efforts for yourself! 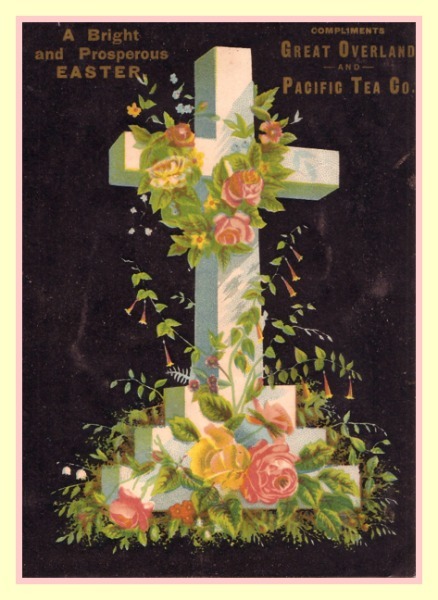 As I shared yesterday, I've collected quite a few tea-themed Easter postcards over the years, but this old advertising label from the Great Overland and Pacific Tea Co. is my favorite Easter image because of the cross, so central to the Easter message for those of us who believe in Christ. Wishing you all a very Good Friday and a blessed Easter weekend! I haven't found any new tea-themed Easter postcards this year, so I decided to make a collage using some of the ones I've collected in the past. I love how all of these designs feature those pretty little yellow Easter chicks, and I like the soft colors of these cards as well. I must confess I was tempted when I went into a local feed and seed store last week—I was looking for plants, not pets—and heard that little cheep-cheep sound I recall from when we had chickens when I was a little girl. But I quickly realized my husband would think I'd lost my mind if I came home with baby chickens, so I left them for someone else. 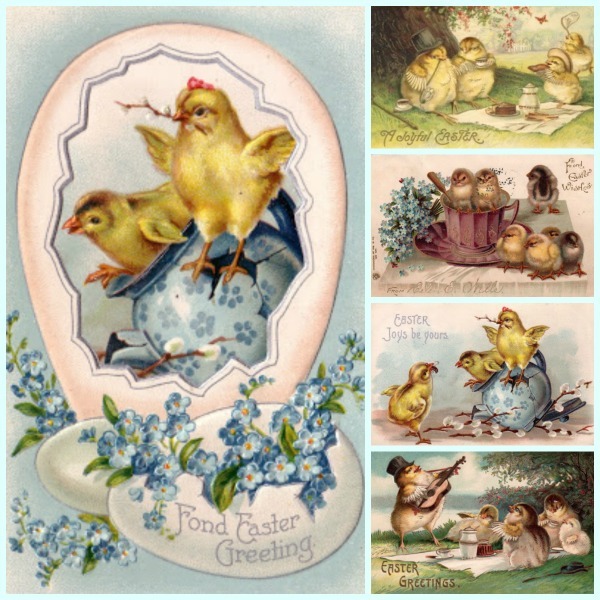 The yellow teawares always come out at my house at this time of year, but I'd love to create a robin's egg blue vignette similar to those sweet Easter scenes featured here. Do you have any special Easter decor out at your house? 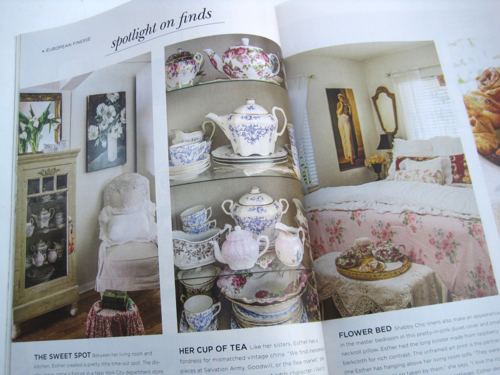 Okay, I really should have blogged about this sooner, because the Spring issue of this magazine probably won't be on newsstands much longer, but I have to tell you how thoroughly I have enjoyed reading through the pages of Romantic Country lately, especially after spotting so many yummy teawares! 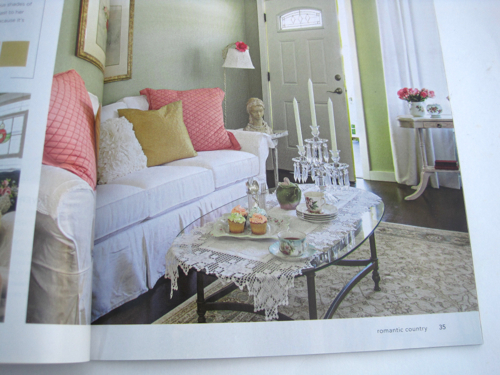 And this is from the feature on the sister known as The Handcrafter. There are many, many more great photos, but I wanted to share just a taste to whet your appetite and not spoil the fun for anyone who hasn't read this issue yet. 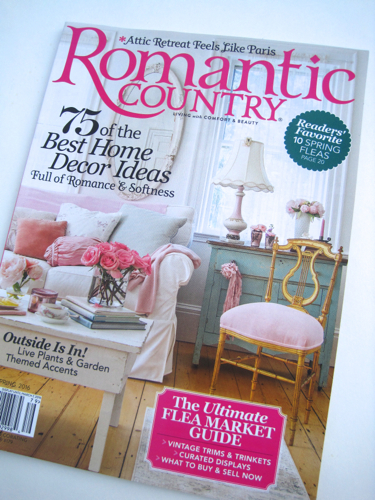 Romantic Country has quickly become one of my favorite magazines. Do you read it? 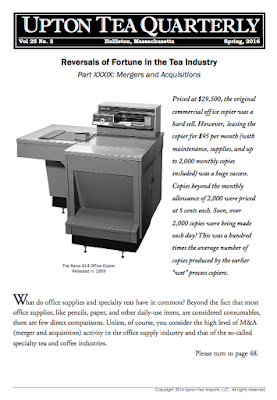 The Spring 2016 issue of the Upton Tea Quarterly landed in my mailbox the other day, and I was surprised to see an old office copier on the cover. It illustrates Part XXXIX: Mergers and Acquisitions (XXXIX!) 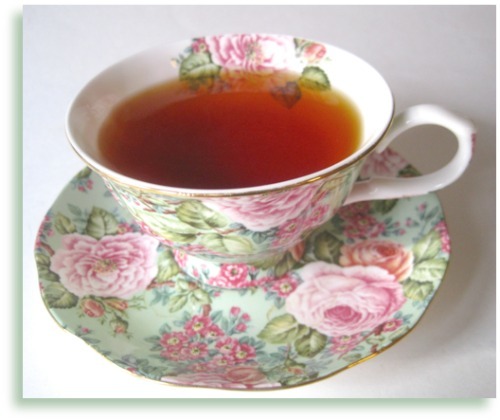 of the series "Reversals of Fortune in the Tea Industry," and a discussion of office supply company mergers and acquisitions leads into a discussion of mergers and acquisitions in the specialty tea and coffee business. 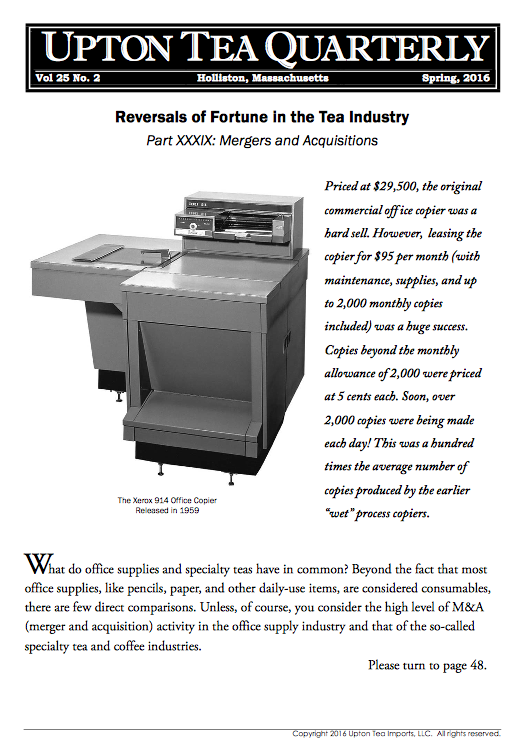 Many of the old office supply stores and chains were founded in the 1980s and enjoyed rapid growth, the article points out, but the with the advent of email, scanning, and disk storage, many of the old paper-managing systems were no longer needed, and naturally the office products industry was affected. The article compares this once-growing field to the coffee and tea industry, which it notes that some people continue to view as a single industry. According to this article, back in 1994, Starbucks bought a 24-store chain called The Coffee Connection. The chain had been owned by a George Howell, who also had a passion for tea and had sold loose leaf teas at The Coffee Connection. When Starbucks bought the chain, they decided to sell their own tea brand, Tazo, which replaced the line that had been sold by George Howell. Tea-drinking customers of The Coffee Connection were not happy. The Upton article notes, "We soon learned that employees of The Coffee Connection, now employed by Starbucks, had been told to give their unhappy tea customers the phone number of Upton Tea Imports. Business at Upton Tea Imports grew 20 percent overnight!" And the article concludes, "There were, however, some glitches that had to be untangled over the coming months." I must confess I'm not sure where this article is headed with this discussion of mergers and acquisitions in the tea and coffee industry, but I'm curious enough that I'll definitely be reading the next installment in the Summer issue! Click here to read the current article for yourself. 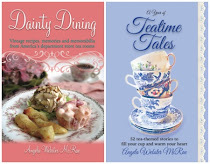 March Giveaway: Three signed copies of "A Year of Teatime Tales"! I am so pleased to announce that for the March giveaway, I am offering a signed copy of my new book, "A Year of Teatime Tales," to three lucky winners! My proof copies of the book arrived last week, and I am so excited that this has finally become a reality. To celebrate, I thought it would be most appropriate to give away a few copies here since you are the ones who encouraged me to compile these stories into a book! And for those of you who have been patiently waiting, the book is also available for ordering now via the PayPal button at right. I'll be accepting orders through Friday, April 1, and the books should be shipped to me within two weeks of that time. (Since I recall that a number of you who purchased my first book preferred to pay by check, for Tea With Friends readers, I'm happy to accept a check if you prefer to order that way. You may contact me via the e-mail button at right, and I'll send you my snail mail address.) For all orders, please let me know if you want your book(s) signed and, if so, whether it's for you or someone else. Also, for this period only, I am offering free Media Mail shipping. The book will eventually be available through Amazon, although I've heard it can take a few weeks to be listed once the author has approved it. So enough of all that! Would you like to win a signed copy of the book? Just leave an "Enter me" to this post between now and 7 a.m. on Monday, March 28, and you'll be entered to win. (US and Canada only, please.) 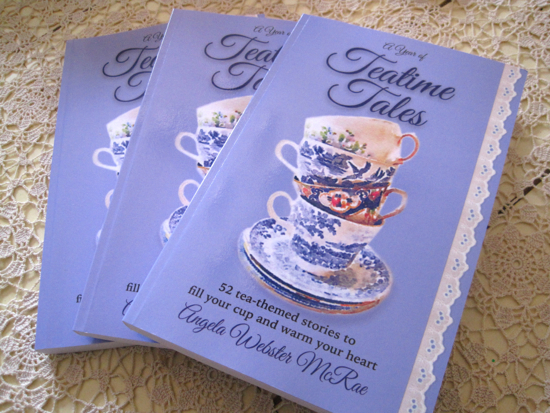 Thanks for all your encouragement of "A Year of Teatime Tales," and good luck winning a copy! • I love to read about Hawaiian history. 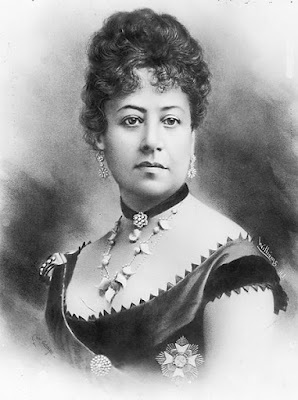 I've always had an interest in Queen Liliuokalani (I love the beautiful sound of her name), but it's another Hawaiian queen who is said to have been a tea lover. Queen Emma, above, was the queen consort of King Kamehameha IV from 1856 until his death in 1863. According to the book "Emma: Hawaii's Remarkable Queen" by George S. Kanahele, Emma was a fan of "Anglicanism, Victorian morality, the superiority of British parliamentary government to American republicanism, the English tradition of tea, and so on—she had indeed acquired an 'English lady's education.'" 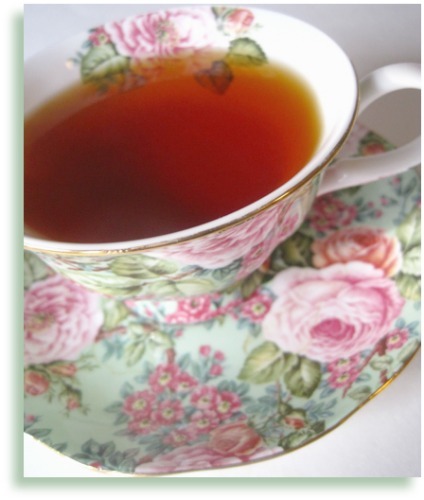 I think someone in Hawaii ought to create a "Queen Emma's Blend" of tea. Maybe a nice pineapple blend? 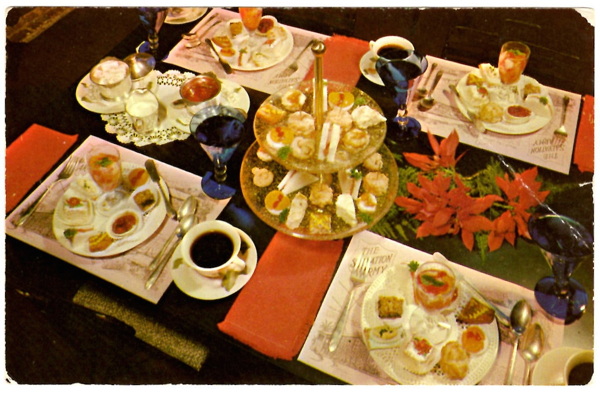 • There are names to know in the world of vintage tearooms, and one that I've come across over and over in my research through the years is the Waioli Tea Room in Honolulu, a tearoom that was operated by the Salvation Army. In an act of perfect timing if ever there was one, my friend Nancy Reppert (a Pennsylvania tearoom owner herself) added to my tearoom postcard collection just yesterday when I went to the mailbox and found she'd sent me this charming postcard from the Waioli Tea Room titled "Tea Time." I blogged about this tearoom here back in 2014. 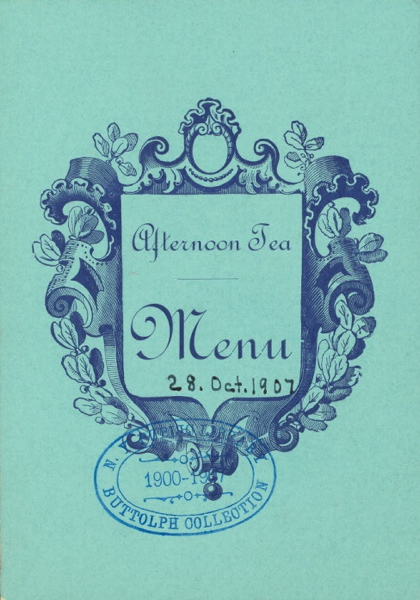 I've seen a photographic postcard of the interior many times, but I've never, ever seen this "Tea Time" postcard before. Aren't those plates and the tea tray tempting? I never made it to the Waioli Tea Room before it closed, but it lives on in postcards and, I can well imagine, in people's memories! 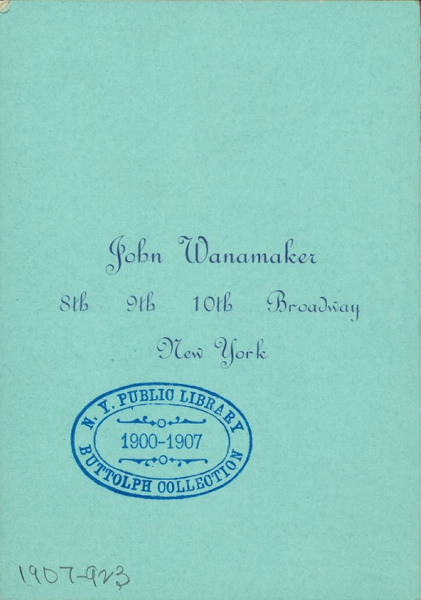 This menu comes from the John Wanamaker store in New York, and I have become a fan of the Wanamaker stores even though I never had the pleasure of shopping or dining at one! 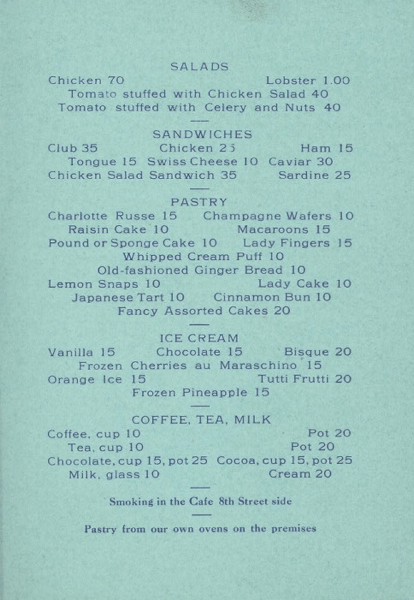 I note with interest that some items remain much the same today (Chicken Salad Sandwich, anyone? 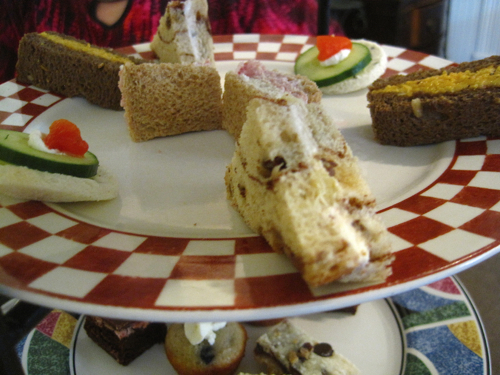 ), but there are two tea sandwiches listed here that give me pause, and I'll bet you can guess which ones they are! 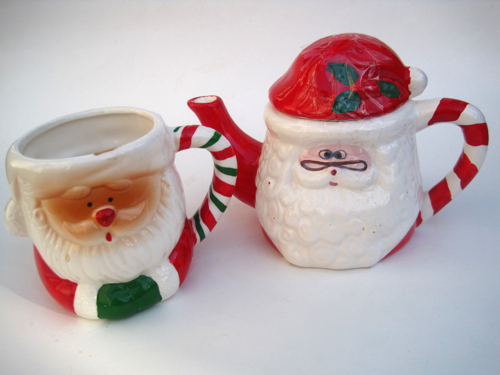 Last Friday, my Aunt Jane and I spent the day shopping in Rome (Georgia, not Italy, alas), and I was pleased to add to my Santa mug and teapot collection for under $2! 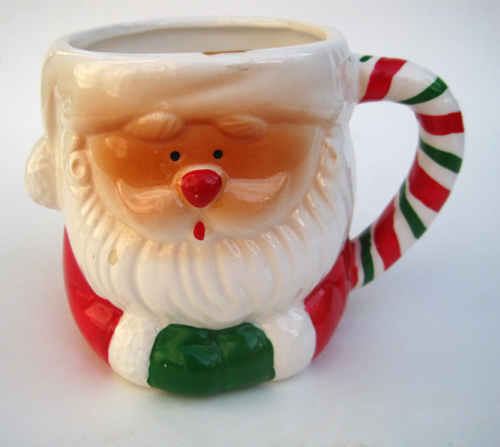 I knew immediately this 55-cent mug was going home with me because it's got a design that is slightly different than my other Santa mugs, and I also liked the striped handle. 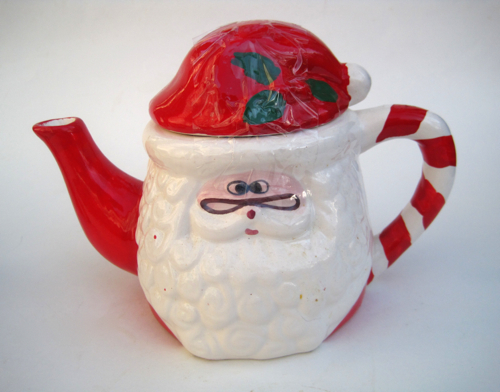 But my happiest find was this 99-cent Santa teapot! 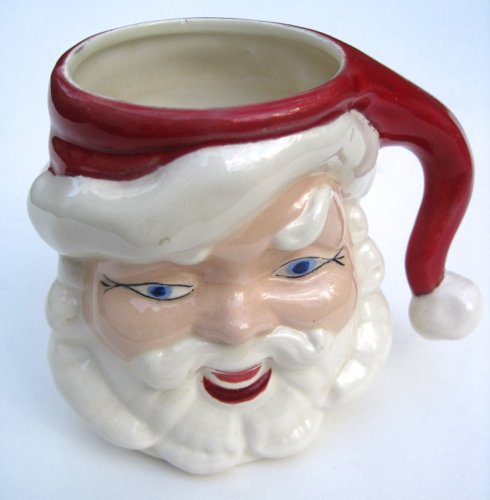 I have a mug (or two, or three …) with this exact same Santa face, but I've certainly never seen it in a teapot design. Christmas is already looking to be a good one this year, and I'm thinking I'll have enough Christmas teawares (to say nothing of Santa mugs) to serve all my friends and maybe the neighbors, too! 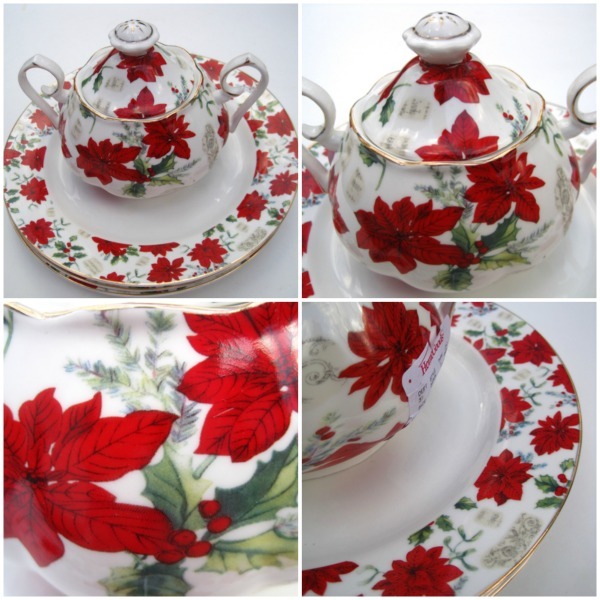 Back in December, I blogged about finding this Christmas chintz teapot and tea tray at T.J. Maxx, and I bemoaned the fact I left the sugar and creamer in that same pattern when I had spotted them earlier. (In my defense, I had seen the sugar and creamer before I saw the other pieces, so I had thought it was not wise to buy a sugar and creamer when I had nothing else in that pattern.) 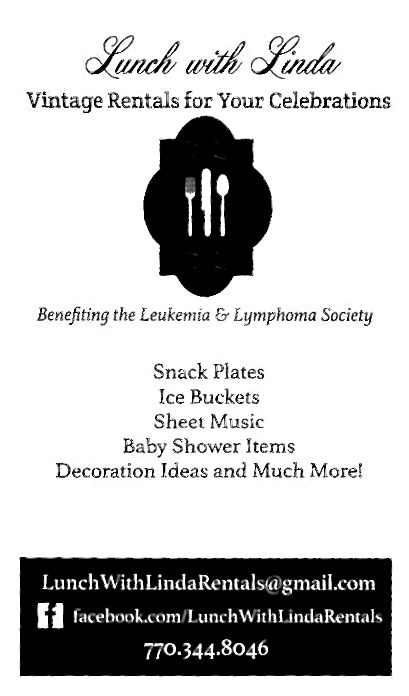 Joy read that and remembered me when she was shopping in Chattanooga one day and found the lidded sugar bowl and three luncheon plates on clearance. She went ahead and got them in case I wanted them, and I was so, so happy to receive them on Saturday! I would have been happy to receive them any way I got them, but now I have the happy memory of having tea with Joy that is associated with these teawares as well. 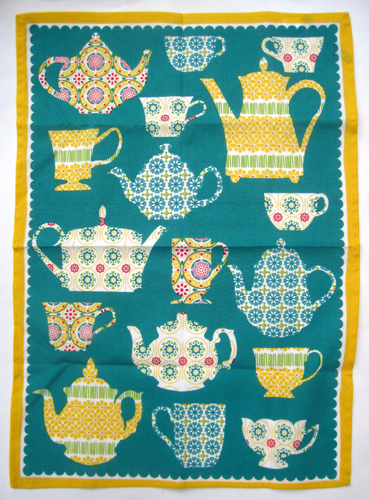 And I was also happy to receive a gorgeous new aqua tea towel, which is now proudly hanging on the stove in my kitchen. Thanks again, Joy, for thinking of me with new Christmas teawares … and such perfect gifts as well! Now there's a headline I've been eager to write! I haven't been to an actual tearoom this year, but on Saturday, I had the pleasure of meeting and enjoying tea with someone I met through this blog, my fellow Georgian Joy Breedlove! When I finally sat down and caught my breath, I began to take in the details of our table. 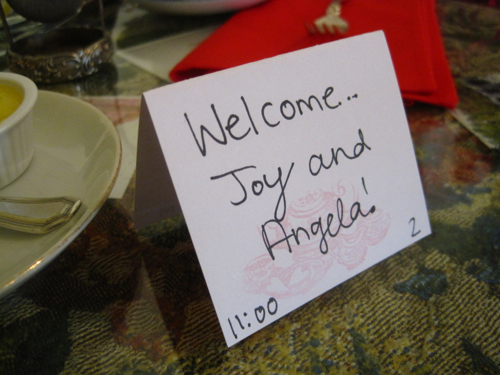 We both appreciated the little welcome card, and Joy didn't seem bothered a bit that I had to pause and snap pictures of everything! 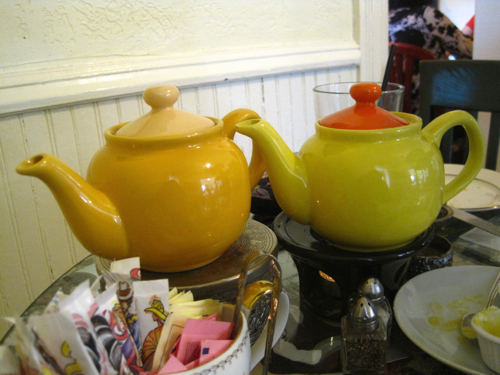 Our server quickly took our tea orders, with Joy having a green Darjeeling and me drinking the tea of the day, a persimmon-flavored rooibos. We both enjoyed our teas, and later Joy opted to try another, the Cheeky Peach. After she bragged on it and offered me some, I tried it, too, and we both agreed it was a very peachy peach! 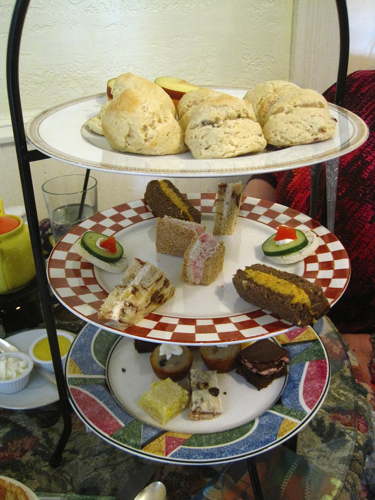 If you click here, you'll see that Tea Leaves and Thyme has a nice variety of afternoon tea offerings. Joy wisely went for the Light Afternoon Tea, which was the equivalent of Full Afternoon Tea anywhere else. I had skipped breakfast and decided to order the Classic Afternoon Tea. 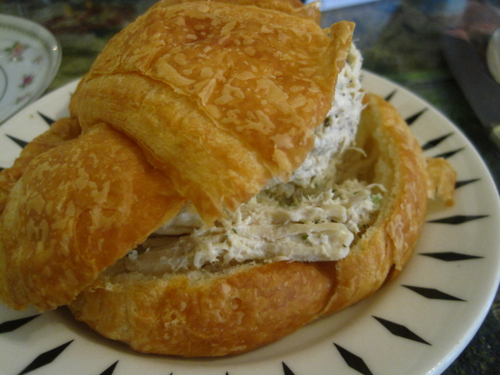 My chicken salad croissant was divine, but it was so huge that I was halfway full before I even touched the tea tray. Next time, I'll hopefully remember that Light Afternoon Tea is plenty here! Our tea tray came out promptly, and the server took a few moments to explain what everything was. I was so eager to talk to Joy, I didn't take notes as I usually do, so I'm probably going to be guessing what a few things were! 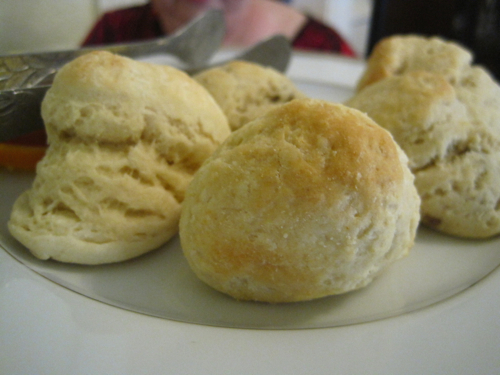 We each had three different types of scones (plain, pecan, I believe, and I don't remember the third because I didn't get around to eating it!). 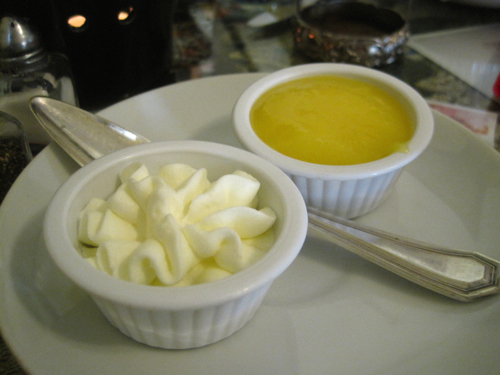 I enjoyed the scones, especially because I haven't had clotted cream and lemon curd in a while! The sandwiches are one of my favorite courses at teatime, and I always enjoy seeing the nice variety of them. The flavors were pineapple cream cheese on raisin bread, pimiento cheese, some sort of shaved ham, and cucumber with pimientos on top. I enjoyed them all, but I think the ham was my favorite. The sweets did not disappoint either! 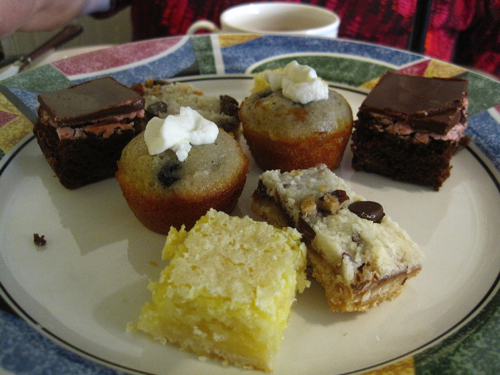 They included lemon bars, a chocolate chip shortbread bar, a cherry chocolate brownie and a blueberry mini muffin. I took one bite of the chocolate chip bar and said oh my, this is so good I'm saving it till the end, and I did! This teatime actually came about because earlier this year, Joy wrote to tell me she had found some china I had been wanting *on clearance* and went ahead and got it for me because the price was right. When we talked about where to meet for the handover, we eventually settled on tea in Woodstock. Tomorrow, I'll show you the lovely pieces I now own because of her thoughtfulness. And much as I enjoyed the tea, and receiving the longed-for new china, the highlight of the day was, without a doubt, getting to meet Joy. She was even more warm and welcoming than I expected her to be, and after we chatted for 2-1/2 hours, I left feeling as if I'd just met up with a longtime friend I hadn't seen in a while. Isn't it amazing, the lovely people we meet because of tea? 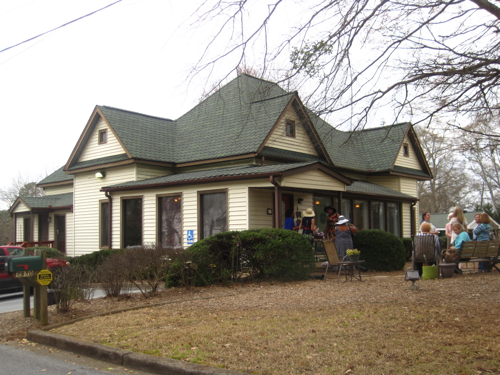 • Arguably the most famous "old style" tea room ever to operate in Georgia was the Frances Virginia Tea Room in Atlanta. Frances Virginia Wikle Whitaker opened the tea room in the heart of the Depression and, by 1931, was serving 1,000 people a day, which meant that 1 percent of Atlanta's population was eating at the tea room each day. 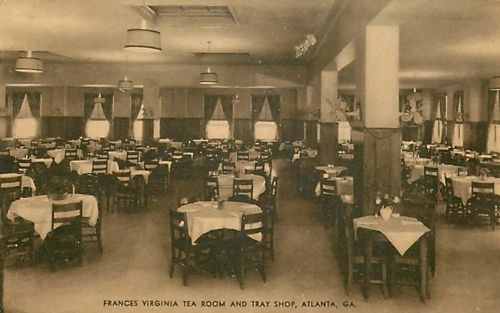 Even so, Frances Virginia is not to be found in any Atlanta history book, but fortunately the Frances Virginia Tea Room lives on today thanks to Millie Huff Coleman, whose aunt, Agnes New, was the last dietitian partner of the Frances Virginia. I've had the pleasure of meeting Millie at a number of local events over the years, and I'm grateful that she and her aunt joined forces to pull out the old Frances Virginia recipes and convert them to sizes for home cooks to use. The resulting cookbook, "The Frances Virginia Tea Room Cookbook," is still available today on Amazon and from used book sellers, and it is one of my most prized tearoom cookbooks! • A tea plantation in India? Not quite. These tea plants are part of a hedge I spotted a few years back at Hills and Dales Estate in LaGrange. According to the Hills and Dales website, "Completed in 1916, the Fuller E. Callaway home was designed to flow gracefully into its gardens—a series of dwarf boxwood parterres, which have adorned the terraces of the hill for more than 175 years and is one of the best preserved 19th century gardens in the country. The classic lines of the 13,000-square-foot home have now silently watched over the beloved gardens for a century." (These gardens, by the way, are not to be confused with Callaway Gardens in neighboring Pine Mountain, which were founded by Fuller Callaway's son Cason.) I loved learning that these tea plants at Hills and Dales provided tea for the Callaway family, and you can read more about that here. • You know how you start researching one thing on the Internet and that leads to another thing and then another? I was skimming a Wikipedia article on tea production one day last year when these two lines stopped me in my tracks: "Commercial tea cultivation in the Americas was first attempted in 1744 in Colonial Georgia, when tea seeds were sent to the Trust Garden in Savannah. 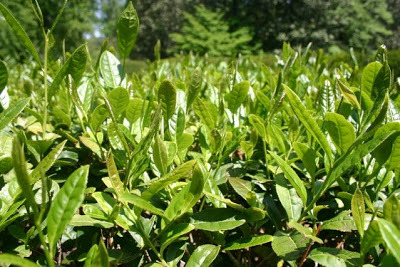 The first recorded successful cultivation of the tea plant in the colonies is recorded as growing on Skidaway Island near Savannah in 1772." 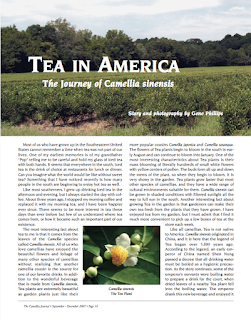 That tidbit included a reference to a 2007 article in The Camellia Journal (above) which shares more about the early efforts to grow tea in this country. Although tea was growing here by 1805, the effort was not a big success. 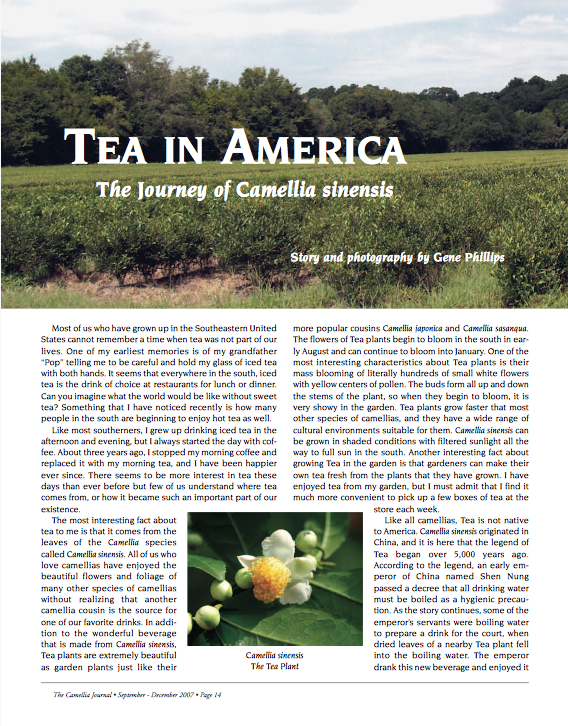 The article notes that the most successful tea-growing effort in America was near Charleston, S.C., and I know many of you are already familiar with the Charleston Tea Plantation. 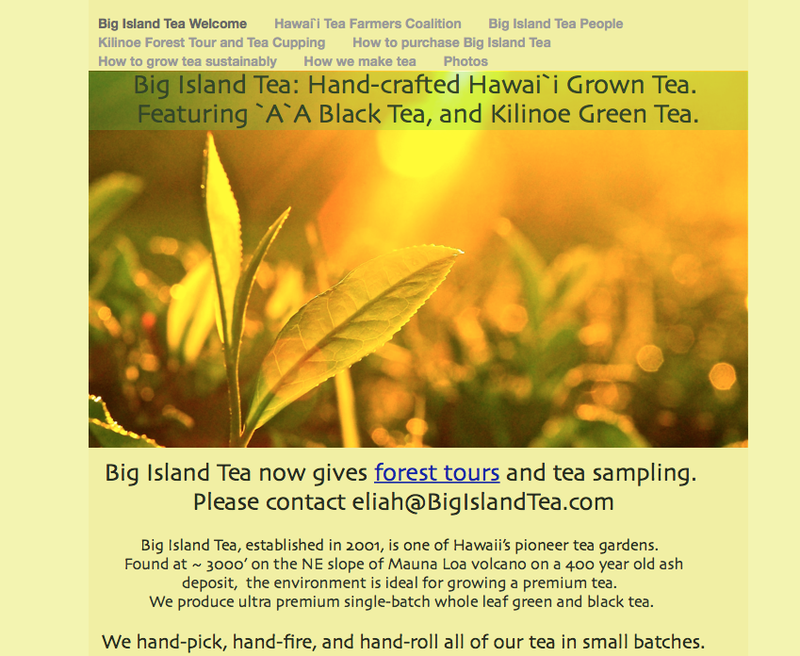 (It's a great place to visit for a tour of a tea-growing operation, by the way, if you haven't already.) As a lifelong Georgian, I was so pleased to learn that Georgia was the first of the colonies to be recorded as successfully growing tea in this country! 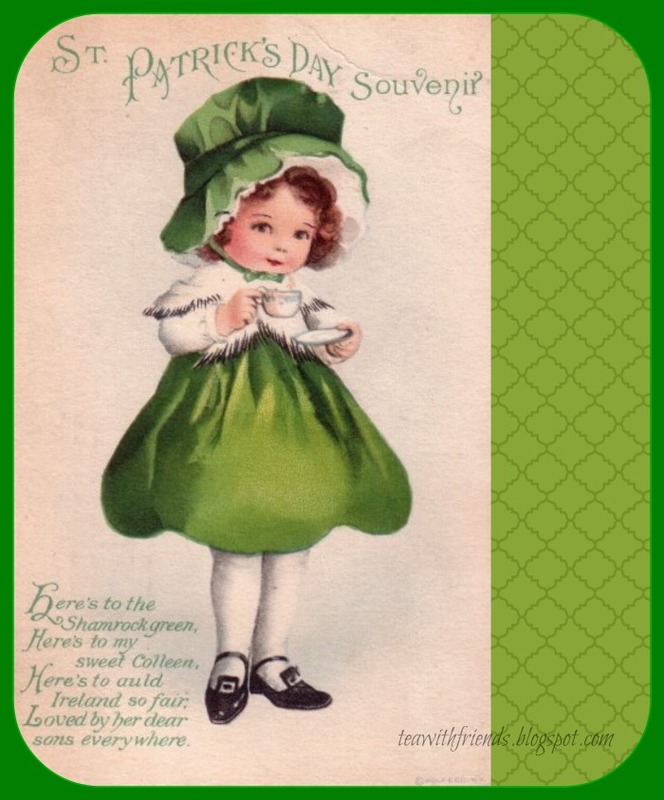 In 2014, I had a year-long project of collecting vintage tearoom postcards. I originally planned to feature one from every state, but alas, Alaska tripped me up early on! Try as I might, I couldn't locate a vintage tearoom postcard from Alaska, so I just left that alert up on eBay in case one ever appeared. And lo and behold, I recently found it—a postcard advertised as being from the Moraine Lake Tea Room in Alaska. It's postally unused so I don't know the era, but if I had to guess, I would say … old! Cool, huh? After my "Alaskan" postcard arrived, I began to Google to see what's near Moraine Lake today. To my surprise, Moraine Lake Lodge is still in business, and the view today looks very much the same. 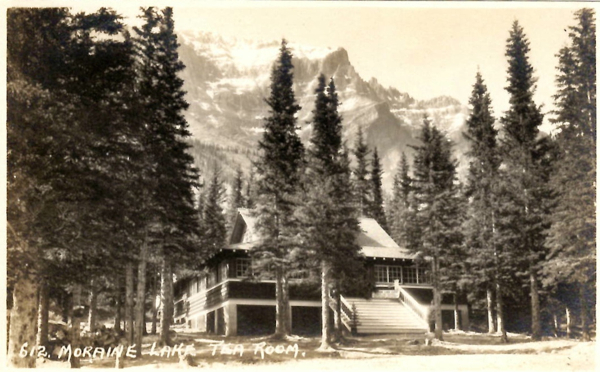 To my even greater surprise, I learned that Moraine Lake Lodge is in Alberta, Canada, not Alaska, so it's back to the drawing board on finding that vintage tearoom postcard from Alaska! 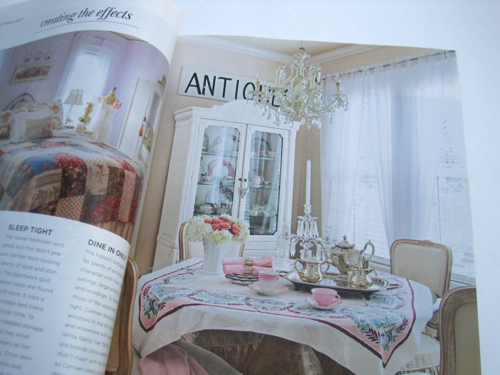 "A Year of Teatime Tales" … is on the way! A chocolate teapot: yea or nay? A memorable sendoff for "Downton Abbey"